Sister Nancy Gunderson, a Benedictine Sister of Annunciation Monastery, Bismarck, pondered those words from words from Pam Kossan, a University of Mary alum and nurse who is leading the Mary Mission Team to Uganda. Sister Nancy was taken totally by surprise and didn’t think it could be possible, but the words burned in her soul. Sister Nancy brought the request before the Annunciation Monastery prioress and council. It would be the first step in discernment. “Not expecting their affirmative response, I was again surprised by their “yes” and even their encouragement,” she said. As plans and funds began falling into place, Sister Nancy was reassured that this is where God is leading her. The school where Sister Nancy will teach in Uganda is named after St. Philomena so she contacted The Universal Living Rosary Association, who take St. Philomena as their patroness to see if they would be willing to donate 350 medals of St. Philomena and 500 rosaries for the children. The Association responded with a “yes,” and surprised Sister Nancy with a 27.1# box of everything she requested and more. The local bishop in Uganda will bless they school when Sister Nancy and the mission group are there to dedicate the new church that is currently being built. “We needed to collect toothbrushes and toothpaste to take to Africa, and it just so happened that a bag of 150 of them were left over from a charity project the Sisters of Annunciation Monastery donated to,” explained Sister Nancy. The children at St. Philomena’s need black Oxford-style shoes, with ties, as part of their school uniform so they can trudge through the rough terrain to get from their villages to school. Sister Nancy’s family in Minneapolis took her to Once Upon a Child when she was visiting and purchased eight pair of black tie shoes to bring to the children. More shoes are being collected for children ages four through the teens. Sister Nancy, a gifted artist, is in the process of making a story art quilt about St. Philomena and the school and church in Uganda, which she will present to the children. 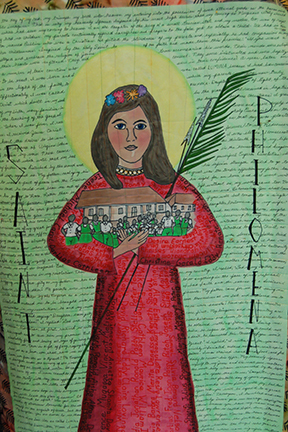 The quilt tells the story about St. Philomena and includes the names of the children who will attend the school where Sister Nancy will teach.